Abrasion: The wear and rubbing of the surface of a fabric. Aramid: A family of heat and flame-resistant fibers used in materials for bulletproof vests and radial tires. Areal Weight: The weight of a fiber reinforcement per unit area (length x width ) of a tape or fabric. Calendering: A mechanical finishing process where fabric is passed between heated rolls under pressure in order to produce special effects such as a glaze, polish, moiré, or embossed surface. Conex®: Registered trademark of Teijin. A member of the meta-aramid fiber family that is both flame retardant and resistant to high temperatures. Contamination: Undesirable material that causes poor wetting of chemical treatments such as adhesives or coatings. Creep: A continuous, permanent elongation under a sustained load that results in a change in fabric shape. Denier: The weight in grams of 9000 meters of a fiber filament. The lower the denier number, the finer the yarn. Denier is used in connection with most most man-made fibers. 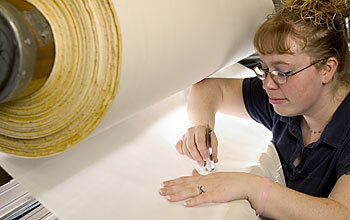 Extraction: The process of removing impurities from a substrate with a vacuum. Kevlar®: DuPont's trademark para-aramid fiber. Kevlar® is lighter and stronger than steel but loses its desirable properties when exposed to the sun for extended periods of time. Leno Mesh: A weave where warp yarns are arranged in pairs with one twisted around the other between picks of filling yarn. This weave adds firmness and strength to an open-weave fabric and prevents slippage of yarns. Monofilament: A single filament of a manufactured fiber, usually in a denier higher than 14. Monofilaments are usually spun one at a time. Multifilament: A yarn consisting of many continuous filaments or strands. Nomex®: Registered DuPont trademark for a flame retardant meta-aramid fiber marketed and first discovered in the 1970s. Nomex® is primarily used in the manufacture of flame-resistant clothing. 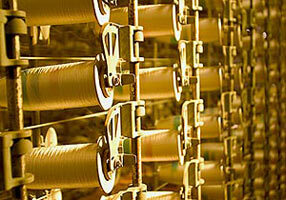 Polyester: A man-made fiber second only to cotton in global usage. Polyester has high strength, excellent resiliency, and good resistance to abrasion. Its low absorbency allows the fiber to dry rapidly. Polypropylene: Any of various thermoplastic resins that are polymers of propylene. They are hard and tough and are used to make molded articles and fibers. 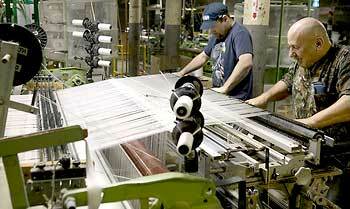 Roll Goods: Fabric that is rolled up onto a core after is has been woven. Scouring: The washing of fabric to remove impurities before further processing. Scrim: A lightweight, open-weave fabric used as a base fabric for the production of coated or laminated fabrics. Spectra®: Registered trademark for UHMPE (Ultra High Molecular Polyethylene) from Honeywell. Spun Yarn: A yarn constructed from a group of short staple fibers that have been cut from longer continuous-filament fibers and are then twisted together to form a single yarn. Substrate: A fabric to which coatings or other fabrics are applied. Teflon®: Registered trademark for Polytetrafluoro-ethylene (PTFE) fiber produced by Toray. Tensile Strength: Refers to the amount of load a fiber will withstand before it breaks. Twaron®: Registered trademark for para-aramid fiber produced by Teijin Aramid that has high impact resistance (five times stronger than steel), high tenacity, and excellent energy absorption properties. Vectran®: Registered trademark for liquid crystal polymer fiber produced by Kuraray. Noted for its thermal stability at high temperatures, high strength and modulus, and good chemical stability. Vectran® is moisture resistant and is generally stable in hostile environments. Warp: Lengthwise yarns in a fabric that are attached to and run parallel with the length of the loom and the woven fabric. Weft yarn is woven back and forth across the warp yarns. Weaving: The method or process of forming a fabric by interlacing at right angles two or more sets of yarn or other material.